The TADD Tpod has many great options for your Company Success!! Lightweight, portable and No Tools Required! Choose a color close to your brand. Completely transform the look of your Tpod! Tpod stores your Flat Screen within your tpod case. Great look with great function. Room for other display Items or give away's. Store and Ship your flat screen with Peace of Mind! TADD Tpod is a Monitor Stand, kiosk and Shipping case all in one. The lightweight portable pop up demonstration kiosk has a lift able sturdy table to access storage in case. Your durable Roto Molded case is transformed to a fully functional backdrop display kiosk and flat screen stand. Safely stores and ships your flat screen up to a 40". Includes everything you will need for a quick set up or takedown without tools. A workable table area that lifts for easy access to stored items during your event. Choice of black or white finish. Case color wraps and Custom graphic wraps available to customize your Tpod and identify your brand. This product is great if you would like a Flat screen in your trade show booth area and do not want the hassles of renting a flat screen at every Trade Show or shipping your flat screen in a unprotected separate carton. Just ship and show, means everything packs down into your tough roto molded case all items have their designated spots and there is even room for small items or giveaways. At your trade show just arrive and set up and after the show pack down and you are gone! 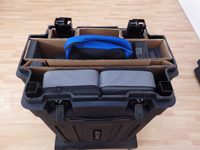 The roto molded case becomes your flat screen stand, so you do not have to wait for your case to be picked up and delivered to you trade show booth at the end of the show. When renting flat screens at a Trade Show expenses quickly add up to the point you can just own this great product, saving you and your company time and money. Ships UPS and FEDEX...Set Up Made Simple! Never rent a flat screen or wait for your case again! Roto molded designer case: comes with 2 handles, 2 wheels for easy portability,4 twist locks and 1 built in handle on top for sturdy maneuverability and foam inserts for flat screen. Display Table: installed on top of case with lift hinge for easy access into case during your event. 2 adjustable insert poles and back panel with velcro tabs to enclose back. Flat screen cross bracket support: just click onto you adjustable insert poles for a easy installation. Accessory Bag includes a plug power strip and storage space for small display items. Directions for easy Set Up. Your Tpod can be branded with a top sign package. This packages come with 2 insert poles with velcro and a top sign. Approximate Signs size is 10" x 33"
You can replace the standard grommet that comes with your Tpod with a Power Hub. Great for using as a charging station. 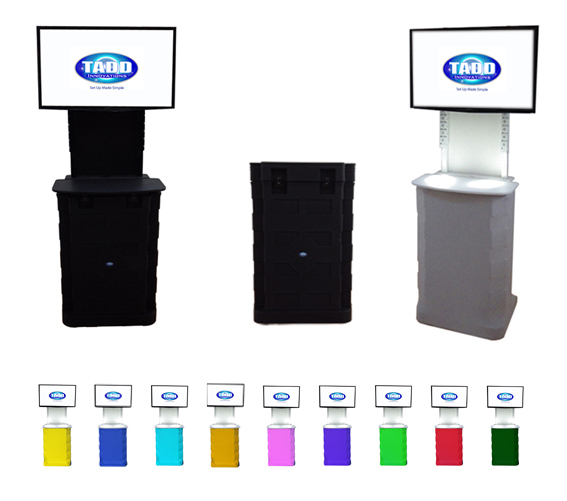 If you want a flat screen in your Trade Show Booth with none of the hassles of renting high price TVs or waiting for your case to return to your Trade Show Booth at the end of your show, than our unique propriety TADD T-pod is what you want.  It allows you to ship and show with ease and display your digital content. 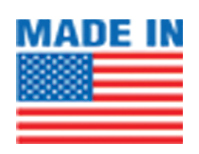 Your flat screen TV stores and ships in the durable custom Roto molded case fully protected. Easy set up and take down this portable monitor kiosk has a supplied large table with lift access storage within the case. Every item packs up and stores inside the case for a convenient Portable Trade Show Kiosk and Monitor Stand.